English: Lesson's motmot, Caribbean motmot, tawny-bellied motmot, blue-diademed motmot; French: Motmot houtouc; German: Blauscheitelmotmot; Spanish: Momoto Común. 2.7-5.2 oz (77-148 g); 15-17 in (38-44 cm). Black crown bordered with violet and turquoise. Black mask with turquoise above and below. Back of neck is rufous, back is green. Greenish underparts and black spot(s) on chest. 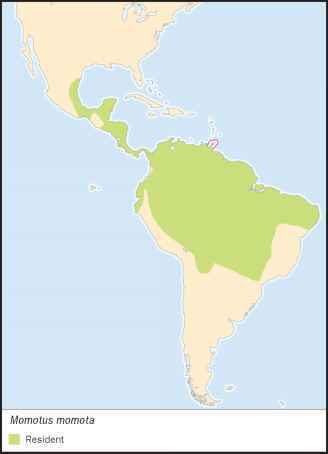 Widest distribution of any motmot, northeastern Mexico to northern Argentina. Occupies a variety of habitats, including tropical evergreen and deciduous forest, flooded and riverine gallery forest, montane and elfin forest, deciduous forest, and secondary vegetation. May range to 4,300 ft (1,300 m). Appear solitary but seem to maintain pair bonds during and between years. They are not very active and often go undetected. Tail often pendulates, sometimes jerkily. Inactive at night, active during twilight at dawn and dusk. Calling most active at early morning light. Consumes insects and other invertebrates, including snails, earthworms, and centipedes. Also small reptiles, mice, and some fruits. Food is obtained by sallying and taken on the wing or off the ground. Fruits are often plucked while hovering on the wing. Blue-crowned motmots consume insects disturbed by trains of army ants. place. Incubation lasts 21 days. Lowland motmots stop covering their young at night when they are a week old. The nest is not clean, yet at fledging juvenal plumage looks fresh and clean. 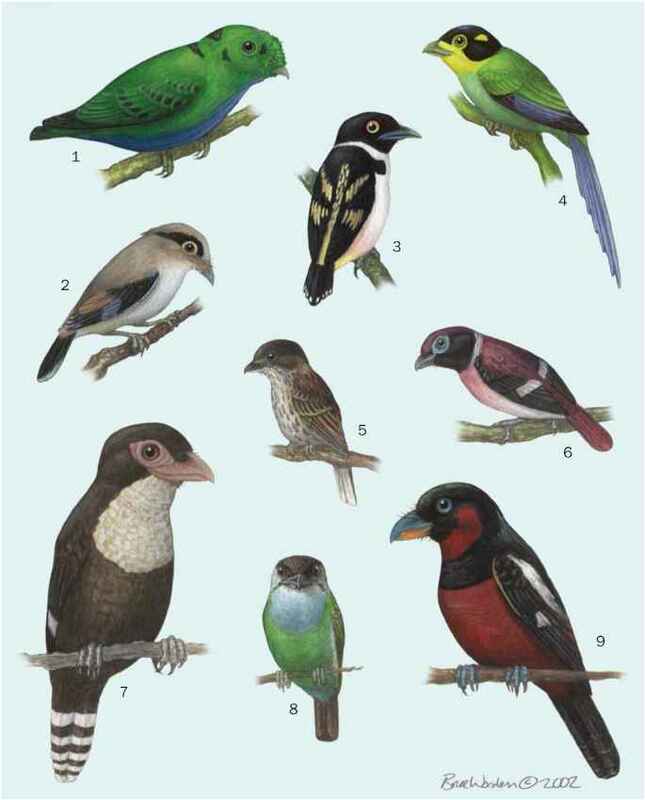 Young resemble adults in coloration but lack long racket-like tail feathers.